The group planning to build what is known as a cohousing development along the 1400 block of Park Avenue has submitted images to City Hall depicting the look of the project. Courtesy of Park City Municipal Corp.
A group readying to build an unorthodox housing development in Old Town has filed paperwork at City Hall, another important step in the efforts to bring a so-called cohousing project to Park City. Greenpark Cohousing, LLC is seeking approvals from the government for the project, which will be situated at 1450 Park Ave. and 1460 Park Ave. Officials anticipate the Park City Planning Commission will begin its discussions as early as late March. The project is designed with 10 residential units. Two old houses on the property now will be renovated and Greenpark Cohousing wants to put up a building with eight townhouse-style units. The building will also have a communal dining area, a communal kitchen and space for a yoga studio, a dance studio or something similar for people who live there. The group has seven members. The development will be built in a U-shape design with the residences around a courtyard. The building is designed to be two stories tall. Greenpark Cohousing wants a second-story terrace incorporated into the project and an outdoor patio on the ground floor. The units will be one-bedrooms, two-bedrooms and three-bedrooms. "That blended well with the rest of the street and neighborhood," said Jeff Werbelow, a Greenpark Cohousing member who is managing the development efforts and plans to purchase one of the units. Under the cohousing ideals, the people who will eventually buy the units and live in a project have an important role in the designs. In a typical development, the eventual buyers generally are not involved in the design phase. People involved in Greenpark Cohousing have said they share common values and interests. 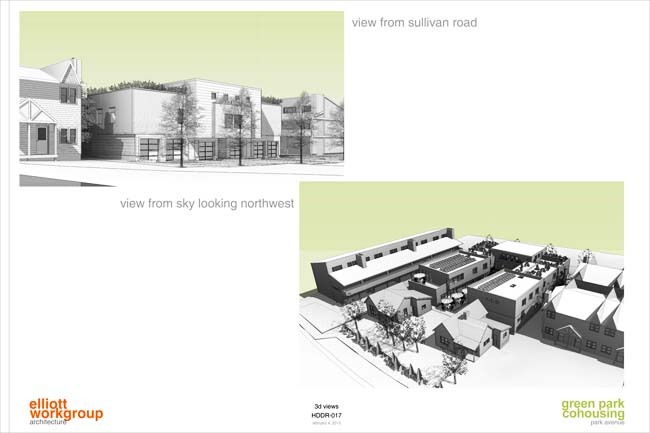 The project will be the first co-housing development built in Park City. The firm submitted applications seeking three approvals that will be needed before the project is started. One, known as a conditional-use permit, is granted by the Planning Commission. Another, a plat amendment, requires a recommendation by the Planning Commission and then a positive vote from the Park City Council. City Hall staffers, meanwhile, are able to grant the third approval, which would be a determination that the project meets Old Town strict design standards. Werbelow said he anticipates the Planning Commission spending time discussing parking issues. He said the blueprints call for garages to be built in the back of the project as well as parking spots along Park Avenue with curb cuts so vehicles will not be left on the street itself. A statement accompanying the paperwork argues that the project will fit well into the location. The statement says it will be compatible with the neighborhood and will "provide affordable housing ownership for a diverse population . . ." It also says the development is seen as a place where full-time residents will live, an indication that the units will not be put into the rental pool. "The scale, massing, proportion and form of the new construction units will be appropriate to the visual character of the historic district," the statement says, noting that the site offers "convenient access" to neighborhood infrastructure. Werbelow said he hopes for approvals by the middle of May. If the project is approved, Greenpark Cohousing will then need to finalize a construction loan with a private-sector lender. Werbelow hopes for a groundbreaking in June or July. Construction is expected to take between 10 and 12 months, a schedule that would put move-in dates in the summer of 2014. The firm has said the construction will be done in an environmentally friendly manner. The buildings will be outfitted with energy-efficient features. City Hall currently owns the land where the project is proposed, and Diane Foster, the interim city manager, signed the paperwork filed at the Planning Department. The municipal government in late 2012 agreed to sell the land and the two old houses to Greenpark Cohousing. The price is $400,000. Werbelow said the purchase will likely be finalized by May 15. Officials chose Greenpark Cohousing to be the purchaser over two others that wanted the property. The others could have been more lucrative. Neither, though, guaranteed the all the money immediately.